If you’ve been thinking about it, you’re not alone. More and more folks are deciding they’re no longer comfortable including the sacrifice of a bird (or any other animal) in their holiday dinner plans. The discomfort of disapproval from some friends and family is a worthwhile trade-off for the peace of mind that comes from opting out of a ritual that more often than not supports the horrors of factory farming. With at least eight farms under quarantine in the Fraser Valley right now in an attempt to squelch the spread of a particularly virulent strain of avian influenza, surely it is perfectly appropriate to raise awareness about how our collective consumer choices have led to this madness. 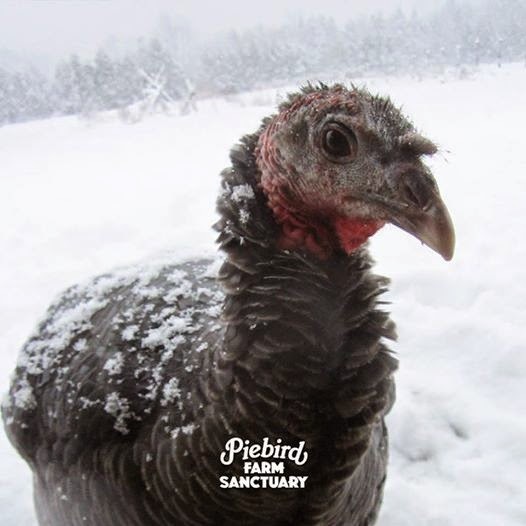 Over 2.5 million turkeys are raised in BC each year, with approximately half consumed during the Christmas season. Last week in one barn alone in the Abbotsford area half of the birds had already died from the flu (thousands in just that one facility). 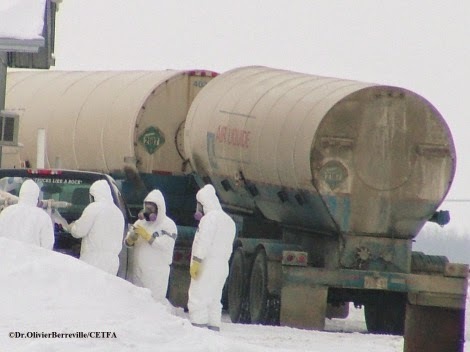 At least 165,000 others are slated for/or have already been "euthanized" with gas - a highly controversial method of killing previously documented by CETFA (Canadians for the Ethical Treatment of Farm Animals) as involving a staggering degree of suffering. That's right, this isn't the first time drastic measures have been taken to try and contain avian flu in the area where Courtenay's Butcher's Block and other local retail outlets source the vast majority of their conventional Christmas birds. Since 2004 over 17 million birds have been destroyed on these factory farms instead of going to a slaughterhouse in preparation for the marketplace. 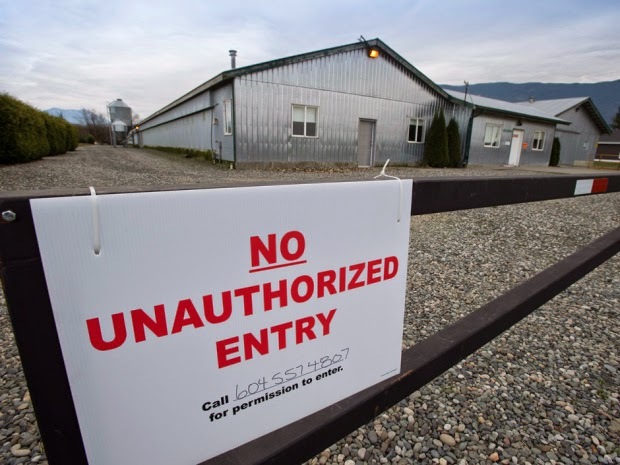 We keep hearing that bio-security measures have been vamped up to try and prevent re-occurrence of disease outbreaks, but as Ray Nickel of the BC Poultry Association recently explained to reporters, "biosecurity is risk management, not a guarantee." To date, no one is sure how this latest flu has defied existing protocols. All we are hearing on the news is the assurance from industry spokespeople that there are “no health and safety concerns” - for consumers of the flesh of those birds already in retail outlets, or even now roasting in ovens around the province - as long as the flesh is 'properly cooked'. 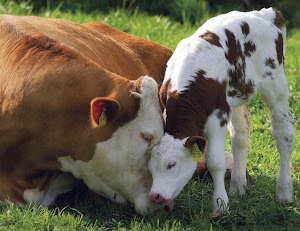 The immense suffering of factory farmed animals isn't even mentioned. The reality that close indoor confinement is a breeding ground for disease, or that turkeys have been horribly mutated through breeding to meet consumer demand for their flesh seem to remain taboo subjects few reporters are willing to touch. Turkeys are the only commonly farmed animal native to North America, and wild ones live in forested land where they can roost high in the trees at night, safe from predators. 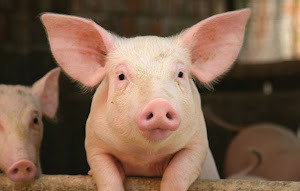 Unlike their domesticated counterparts they have excellent eyesight and can run up to 35 mph. Comparatively, the vast majority of turkeys raised for human consumption today can only manage a slow walk, as they have been bred to be twice the size of their wild relatives, mainly to increase breast volume for the marketplace. They can no longer fly, or even mate (they must be artificially inseminated). In nature these birds would spend up to five months- the age when most farmed turkeys are slaughtered- close to their mothers. In the wild a turkey can live from 10-12 years, but domesticated free-range birds are routinely slaughtered between 14 and 25 weeks of age. BC turkey production is concentrated in the Fraser Valley - there are around 500 poultry operations packed in to the area. Live birds are transported via multi-tiered, flat-bed trucks in crowded, tight wire cages, through all kinds of weather conditions. At the slaughterhouse, they are hung upside down by their legs to have their throats cut while still fully conscious. Lilydale in Abbotsford (one source of Butcher's Block turkeys) has been previously flagged by animal activists for particularly inhumane practises. Heavy birds hanging on the line before slaughter can suffer disjointed or broken limbs, etc. In BC it is only legal to kill an animal raised for food yourself - rather than make sure the act is carried out by the butcher in a government inspected abattoir - if the animal’s carcass is for ‘personal use’ only, and not going to be sold to someone else. In on-line forums that discuss backyard poultry slaughter, differences of opinion abound about the most so-called ‘humane’ way to extinguish a bird’s life. Not everyone is convinced that when a bird ceases to struggle it is actually calm. Some small-scale poultry handlers believe this is more akin to the kind of ‘playing dead’ response many animals resort to once escape seems unlikely. Many agree that avoiding exposing individual birds to the ‘kill process’ prior to their own turn, is integral to stress reduction - a modicum of consideration still admittedly difficult to provide in a backyard operation, and obviously impossible on a standard slaughterhouse assembly line. 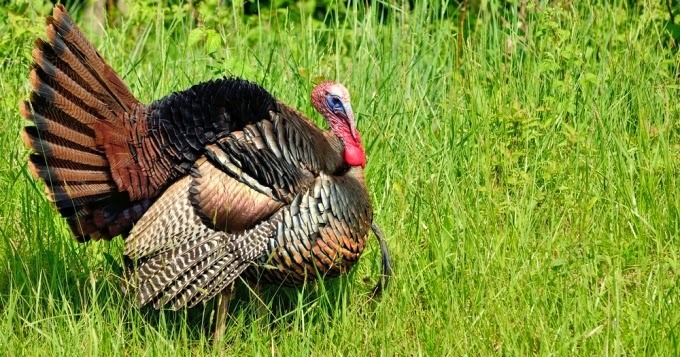 Whether or not one can afford to pay the high price for a certified organic turkey (the feed alone can cost the farmer three times as much, and the ‘finishing’ time is longer), it simply bears remembering that regardless of the 'label' attached, not all animals are necessarily raised, or slaughtered, under the kind of conditions we might imagine. Ultimately, most will meet the same end in a fear-filled environment. Even those folks who take personal responsibility for the act of extinguishing the lives of the animals they choose to eat, cannot deny the fact that death does not always come easy for those who would prefer to live. Whenever we allow ourselves to really 'connect' with an animal, it’s impossible to deny their individual will and unique personality. 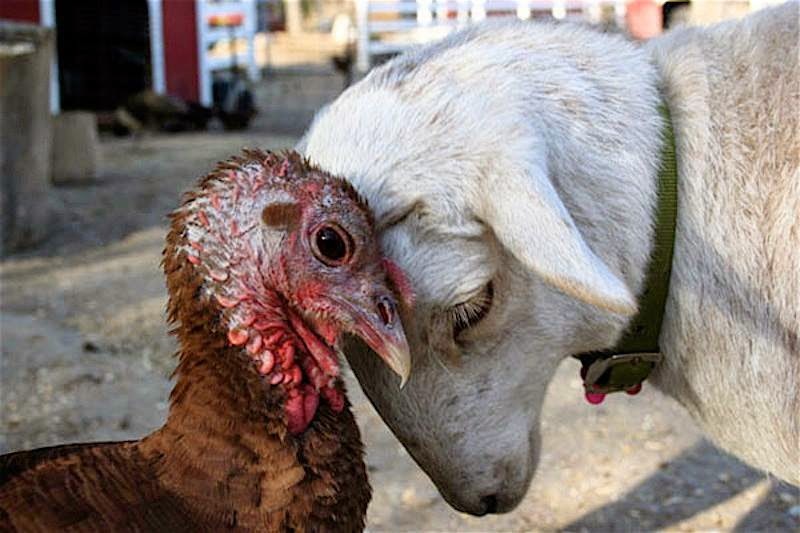 If you find yourself drawn to the idea of going ‘cold turkey’ this season, it’s easy to find inspiring stories on-line about ’companion’ turkeys - birds people have allowed themselves to bond with, and been moved by to include in their circle of compassion. There are lots of wonderful resources on the internet to assist anyone interested in eating lower on the food chain, and you’ll find all sorts of great recipe ideas on Denman’s Virtual Vegan Potluck Facebook page. If you could use some support in the new year, Denman is already home to a friendly community of happy vegans who love to share great food and recipe ideas. Our long running community vegan potluck series has altered course over the past year, but those on social media can follow our frequent foodie Facebook posts HERE and/or get in touch anytime about vegan get-togethers! We are hosting a public gathering in the Backhall once again on Saturday, September 20th, as part of the 2014 Sustainability Festival, and everyone is invited! For what to bring, please see details on the poster above. As mentioned in the Flagstone, this Fall Equinox event is also scheduled as a solidarity action with the hundreds of thousands of people who will be demonstrating in New York City (and around the world) to demand serious action on climate change from world leaders assembling there that week for the 2014 Climate Summit. With apologies to those who were looking forward to the pre-advertised screening of "Mission Blue" -now available on Netflix- we are excited to be sharing instead, another documentary that also addresses water concerns (the theme of this year's festival) along with a host of other sustainability issues the potluck series has been dedicated to highlighting over the past 20 years. The importance of encouraging plant-based dietary choices, and a shift away from dependence upon animal agriculture rather than the prevalent farm animal-centric vision of life here on the west coast will only continue to grow as the global village shrinks and we are reminded by Mother Nature that island life is not itself sustainable in a vaccum. 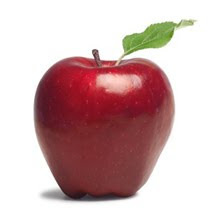 Scroll down the righthand side of this page (to below the apple!) 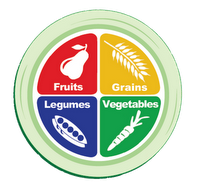 for a list of links that highlight the importance of food choices vs. food miles. 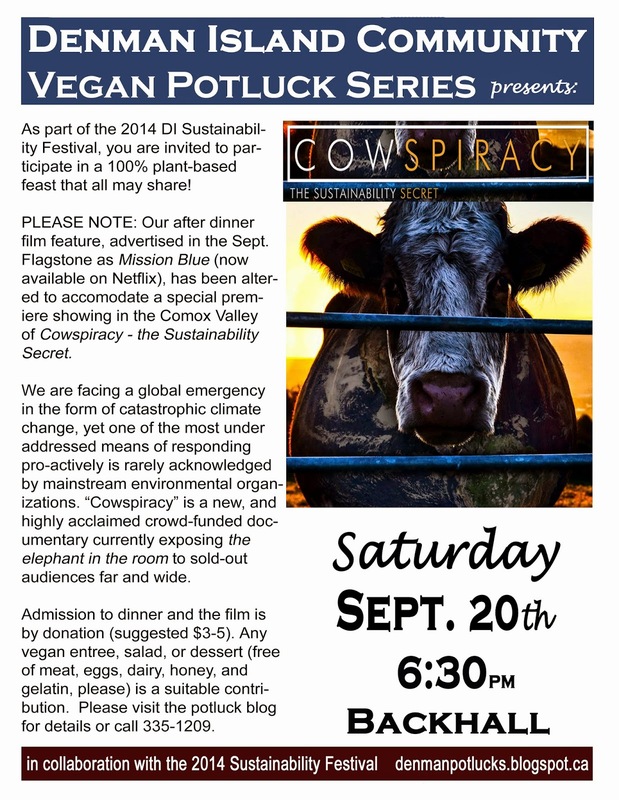 Visit the trailer below for a sneak preview of "Cowspiracy", along with an indepth review by biologist George Wuerthner...you won't want to miss this film! HERE, please find Fireweed's recent article in the Island Word called "Water Wise", also related to Denman's 2014 Sustainability Festival theme. And HERE, for Facebook users, find our activist/resource archive on topical coverage of the under-reported impacts of animal ag. Please refer to the 'About' section for membership info/group guidelines. Come celebrate Winter Solstice with your fellow islanders at this season's Community Vegan Potluck scheduled for Saturday (NOT Sunday! ), December 21st at 6:30 pm in the Back Hall. As always, food lovers of every persuasion are invited to join in on our delicious, turkey-free holiday smorgasbord. After dinner we gather round the blazing Yule-fire to celebrate both the nurturing darkness of winter’s respite and the promise of returning light with carols appropriate to the solstice season! Any 100% plant-based dinner entrée, salad, dessert, or single item dish that all may share (excluding dairy, eggs, honey and gelatin, please) is a suitable contribution for this animal-friendly feast. Begun in the mid 90's, Denman's community vegan potluck series provides the delicious opportunity to pick up creative, and healthy new recipe ideas. However, nothing fancy is required unless you are so inspired! Please include an ingredient list with your offering, and thankyou for attending 'scent-free' to help keep our inclusive community gatherings accessible for folks with chemical sensitivities. Admission is by donation (suggested $3-5 towards expenses). Peace to one and all! Visiting family over the holidays and want to provide a ready-made vegan dish? You are invited to gather with friends and neighbours for a fabulous fall feast this Sunday, October 20th at 6:30 pm in the Denman Backhall! After dinner we'll be screening the award-winning documentary “At the Edge of the World” - an adventure on the high seas with the controversial Sea Shepherd Conservation Society. 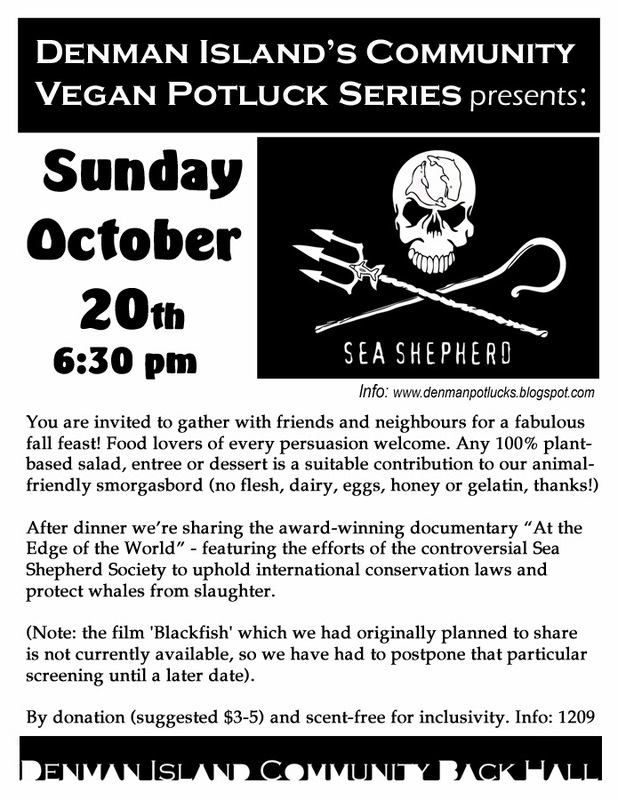 (Note: the film 'Blackfish' which we had originally planned to share is not currently available, so we have had to postpone that particular screening to a later date). The real-life David and Goliath adventure featuring Sea Shepherd's 3rd Antarctic Campaign involves tracking whalers with the intentions of preventing them from violating international conservation laws. 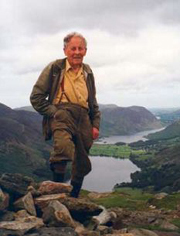 A winner of numerous awards, 'At the Edge of the World' reveals the incredible courage, determination and at times utter recklessness of undertaking such a dangerous mission. 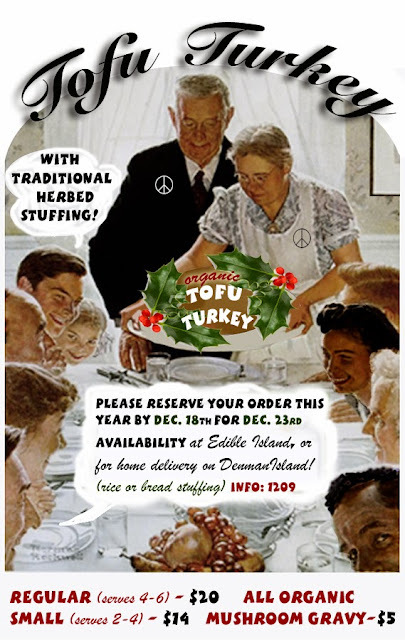 Food lovers of every persuasion are always welcome at our community vegan potlucks, and nothing fancy is required! Any 100% plant-based salad, entree, dessert or single item dish is a suitable contribution (excluding flesh, dairy, eggs, honey or gelatin, thanks.) Please jot down an ingredient list so folks with food sensitivities can make informed choices. 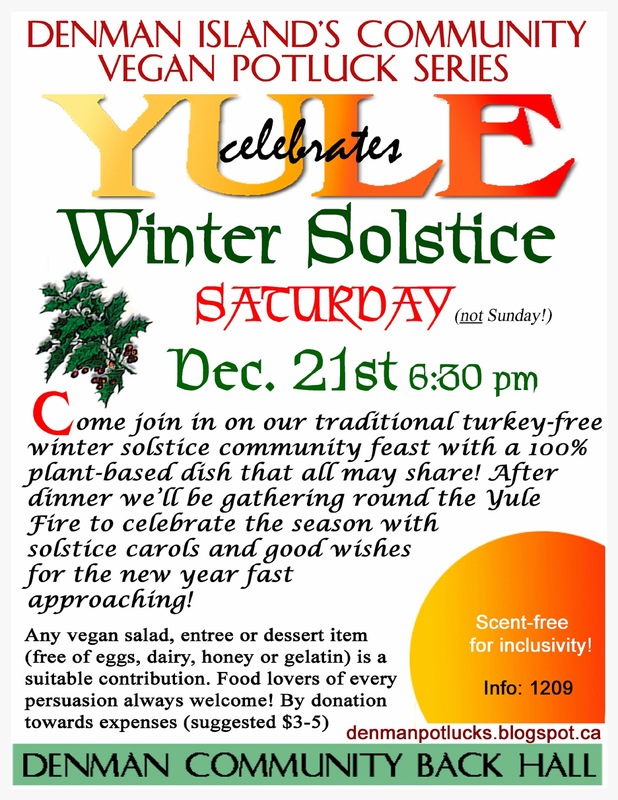 Our gatherings are also designated scent-free for inclusivity. Admission is by donation (suggested $3-5 towards expenses). You can also find the Denman Community Vegan Potluck Series series on Facebook, or call 335-1209 for details. As part of the 2013 DI Sustainability Festival, our Community Vegan Potluck Series invites food lovers of every persuasion to join in on a 100% plant-based feast that all may share! Please note that our venue will be the Senior's Lounge (across the street from the Community Hall where our potlucks are usually held), and that dinner will commence a half hour earlier than our regular potluck schedule. Any completely vegan dish is an appropriate contribution towards reducing our collective carbon footprint (free of eggs, honey, gelatin and dairy, please). Don’t forget to bring along an ingredient list to display with your food. 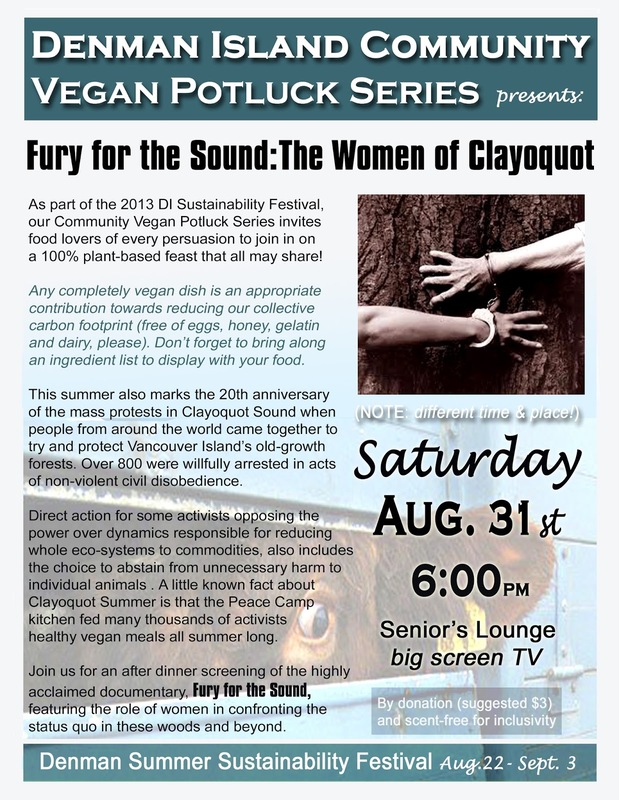 It just so happens that this summer also marks the 20th anniversary of the mass protests in Clayoquot Sound when people from around the world came together to try and protect Vancouver Island’s old-growth forests. Over 800 were willfully arrested in acts of non-violent civil disobedience. Direct action for some activists opposing the power over dynamics responsible for reducing whole eco-systems to commodities, also includes refusing to collude with unnecessary harm to individual animals. 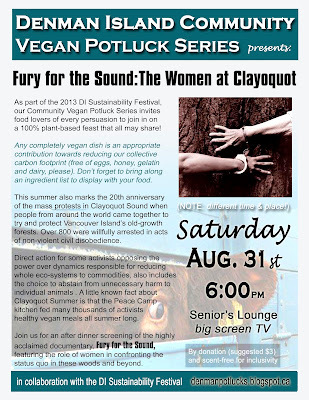 A little known fact about Clayoquot Summer (1993) is that the Peace Camp kitchen in the clear cut known as 'the Black Hole', fueled many thousands of activists with healthy vegan meals all summer long. Plan to stay on after dinner on Saturday the 31st for a screening of the highly acclaimed documentary, Fury for the Sound (1995), featuring the role of women in confronting the status quo in the woods of Vancouver Island and beyond. Today environmental and social justice activists who work to protect the land and the vulnerable of all species continue to struggle against tremendous odds. This herstorical film provides a look at how political activism can be joined with personal empowerment. As we face an unprecedented collapse of earth's ecosystems and the potential for runaway global warming, it has never been more crucial to recognize that protecting what remains of our precious rainforests and curbing the GHG emmissions that animal agriculture unleashes on our fragile ozone layer are related tasks. 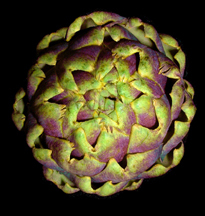 NOTE: The regular vegan potluck series was originally set to reconvene with our quarterly seasonal schedule around the Fall Equinox in September, but because of the 'additional' August event we have decided it makes more sense to stagger the potlucks a bit and hold the next one in October instead. Please mark you calendar for SUNDAY, OCTOBER 20th. We'll be back to our normal time of 6:30 pm in the Back Hall across the street! Mander is an ex-marine turned anti-poaching advocate and powerful spokesman for animals. 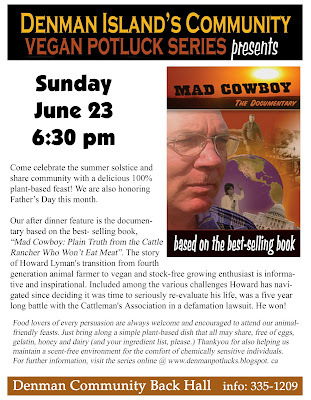 Denman's Summer Solstice Community Vegan Potluck is scheduled for 6:30 pm, Sunday, June 23rd. Come on out and join in on a delicious 100% plant-based feast in the company of friends and neighbours, some of whom you may have yet to meet...everyone welcome! Just a week after Father's Day, our after dinner presentation for this now quarterly series will be a repeat screening of the documentary “Mad Cowboy”. 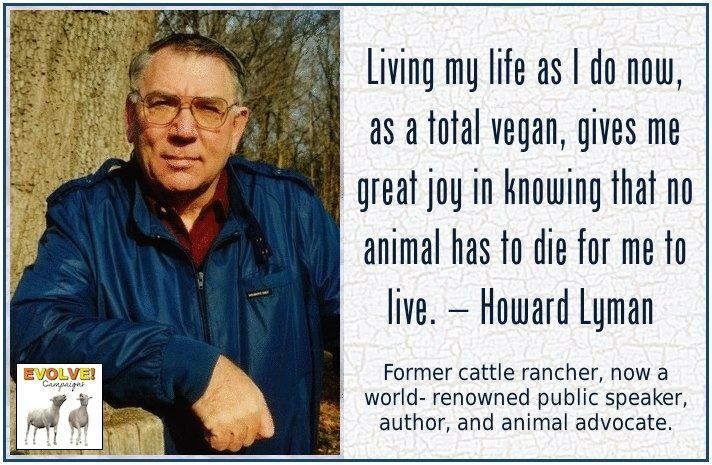 Based on the best-selling book: “Mad Cowboy: Plain Truth from the Cattle Rancher Who Won't Eat Meat”, the story of Howard Lyman's transition from fourth generation animal farmer to vegan and stock-free growing enthusiast is fascinating, informative and inspirational. 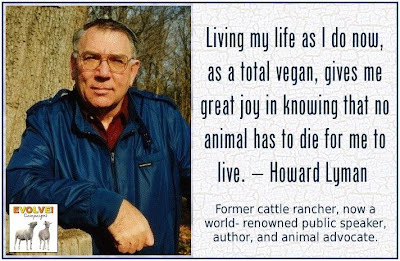 Included among the various challenges Howard has navigated since deciding it was time to seriously re-evaluate his life, was a five year long battle with the Cattleman's Association in a defamation lawsuit. He won! Time permitting- and in the spirit of honoring positive masculine role models during the month of Father's Day- we also hope to share one or two short audio-visual pieces featuring other courageous men who are inspiring a re-evaluation of traditional male privilege in favor of a more just and compassionate world. Any 100% plant-based soup, salad, entree or dessert (free of eggs, dairy, honey and gelatin, please) is a suitable contribution to our well-loved smorgasbord. You needn't be vegan or vegetarian to join in, and nothing fancy is required unless you are so inspired! Call for suggestions if you could use some supportive ideas, and please remember to bring an ingredient list. All plates and cutlery are supplied, and admission is by donation (suggested $3-$5 towards expenses). Thankyou for helping keep the potluck series 'scent-free' for the comfort of community members with chemical sensitivities. For further information call 5-1209, or visit the now quarterly series home page on line. But don't some people need to eat meat? Raw is good but so is Cooked! 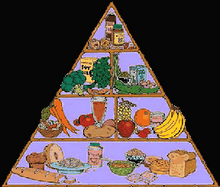 Review of "the Vegetarian Myth"
Blood Type Diet: Fact or Fiction? Eat Local, or Low on the Food Chain? Environmental Footprint of Vegans 30% Lower! From Animal Machines to 'Happy Meat;? Eat Locally, Or Eat Differently? To Save the Planet: Take Meat Off the Menu! What's Wrong with the 100 Mile Diet? Hunting: a sustainable food choice? MORE Food for Thought Links! 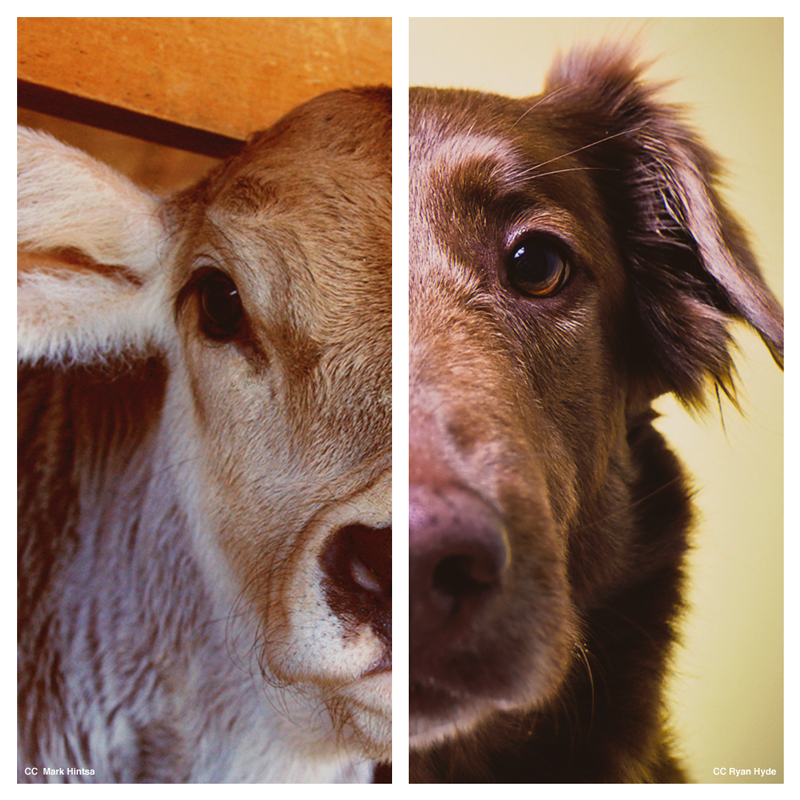 The Orwellian Distortion of "Humane"
Soy vs. Dairy: what's the footprint of milk? Dr. Melanie Joy on "the Psychology of Meat Eating"
home page for the film "Vegucated!" Psychology Today- Have You Noticed the Word, Vegan? Does a diet of plants really cause the fewest animals to be killed? Off the Hoof Magazine online for free! A Life Connected - great short video clip!! Combat global warming with your diet! Meat and Global Warming info galore! Sneak preview from Tribe of Heart! So for the average American, buying local every day of the year would cut their carbon foot print by only around 4 per cent or 400 kg of CO2eq per year. By comparison, shifting just one day a week from eating red meat and dairy to either chicken, fish, eggs or vegetables lowers your emissions by between 252 kg and 400 kg of CO2eq. ~ Source: New Scientist - What is Your Dinner Doing to the Climate? PCRM sues feds over biased dietary guidelnes! Potluck Films You Can Borrow!